Today at 4pm kicks off LBI Thank You Fest. If you missed my first post, this event is to thank those first responders, local and across the country, who helped Long Beach Island in the wake of Sandy. These people were away from their families for weeks if not months to keep us safe during and after Sandy. These people, had homes here that were damaged, but they put helping others above their own home and family. This is a celebration of LBI’s resurgence thanks to these brave men and women who were here on LBI. Today, Friday June 14th, the party begins in Ship Bottom at the waterfront park on 10th street at the bay, right at the foot of the Causeway. At 4pm Roustabouts, After the Reign as well as Shorty Long & the Jersey Horns will be serenading us with 6 hours of live music. There will also be food, soft drinks and wine. For the kids, and those young at heart, there will be a bounce house, face painting, laser tag and fun on the bay, including paddle boarding, sand sculptures and windsurfing. There will also be members from ReClam the Bay, ALO and the townships with exhibits. Saturday, June 15th, will be a day full of fun and events in Brant Beach at 68th Street in Bayview Park and the Long Beach Township Municipal Area. Food and drinks will be available all day as well. The fun begins at 10:45 with the Star Spangled Banner and Ted Hammock with Jason Booth. Celebrity Chef Amanda Freitag will be in attendance as well and you can see her at 1pm. Guy Smiley Band will be rocking at 1:15 and Nashville Star, Jimmy White will be signing CD’s at 1:30. From 2:15 until just before 6 will be non stop music from AJ Stone & The Karma Robbers, Facedown and Last Minute featuring Kim Travers. Then Sean Kingston will be on at 6pm. Katy Tiz will playing at 7:15, then the Nick Clemons Band will be closing the night of music before everyone heads up to the beach for a bonfire. Sunday, June 16th, will be Sidewalk Sales galore in Beach Haven. There will be local vendors and a flea market with gifts and crafts. There will be live music and Elvis at 11:30. From noon to 3 will be a Fantasy Island Celebration. Also, don’t forget to stop by the Chegg from 12:30-1:30 to cheer on the Wing Eating Contestants. There will also be a BBQ at the Beach Haven Fire Dept on Amber Street. Wondering how to get around this weekend with all these great events going on? Don’t worry, there will be a bus running all Saturday and Sunday. All this information can also be found on LBIThankYouFest.org and if you have purchases any LBI is Alive apparel, please wear it with pride this weekend. While at the Fest this weekend, please personally thank any first responders you see. Thank you, to everyone, LBI is Alive because of YOU! As you can see, the Memorial Day countdown is gone. It is now officially, the unofficial start of summer! We survived another off-season, like we always do, and now we are ready for you to come and make memories on LBI and reminisce on old ones. This may be a slightly different Memorial Day weekend, but not as different as you might have expected. I think it will be better. The camaraderie built this winter will only get stronger as houses fill up and neighbors catch up. 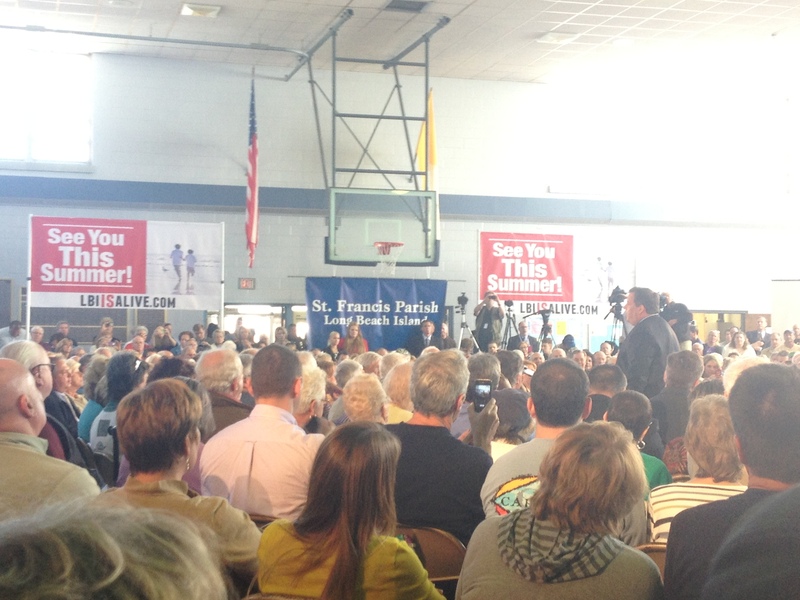 As Christie says, “We are stronger than the storm.” Not my favorite slogan, but maybe I am partial. 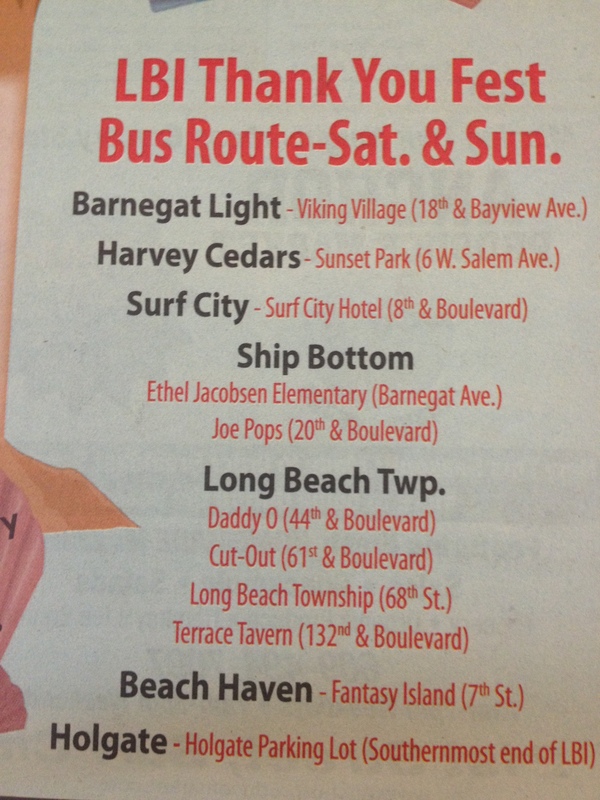 There are so many businesses open this weekend and it is fantastic to see LBI alive with visitors. If you are down here and see businesses open that I do not have listed, please email me at LBIisAlive@gmail.com. I try to add as many as I can, but I am sure I miss some. The guy in the background is my fave part of the picture. FUN., who has vacationed on LBI for two decades. For those of you who didn’t hear the rumors about Gov Christie coming to LBI on Saturday, he did indeed come by and chat with us locals. 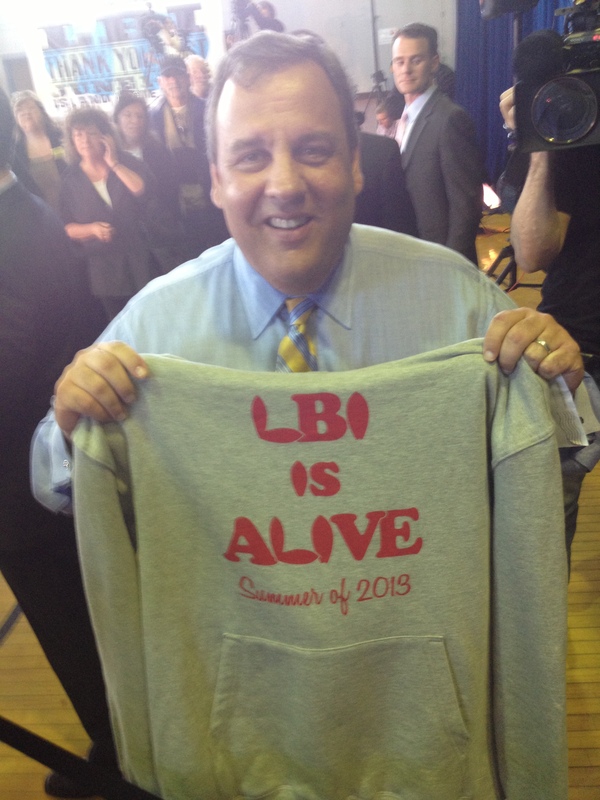 I even was able to finally get a picture with him, since at the town hall I just got a picture of him with the “LBI IS ALIVE” hoodie (which he promised to wear in the near future) and shook his hand. No real ‘news’ from him, I think he just wanted to stop by and show he has not forgotten about our boardwalk-less island. It was a great way to kick off the weekend. If you want to see more pictures or other videos check out this page. I also do not want to skip over the actual meaning of Memorial Day. Thank you to those who have fought overseas and personally to those who have been on duty here. Without them, the rebuilding would have been much more difficult here on the Jersey Shore; and let’s not forget the Boston Marathon Bombings. Take a moment and observe Memorial Day for its real meaning; pick up some American flags or pin wheels and place them outside, dress in red, white and blue, thank a veteran when you see one. Anything to show them we are thankful and have not forgotten them on this weekend of summer celebrations and store sales. Don’t forget, we will also be thanking these local heroes at LBI Thank You Fest next month — hope to see you there! The visitors may be our life blood down here on LBI, but without these servicemen and servicewomen, we would not have been able to do what we do this summer. Memorial Day is less than a month away! Hooray for the unofficial start of summer! Hopefully Mother Nature gets the memo in time. As we know, the media has finally begun to turn in LBI’s favor. This Sunday evening (April 28th), be sure to watch “It’s Your Call with Lynn Doyle” for some positive coverage of LBI. Here is the listing of channels for your areas. Ted Greenburg, of Philadelphia News Channel 10, came down to LBI two days ago for interviews about this summer on LBI and beyond. The Verizon Fios channel (unsure where exactly this will air) also did an interview. If you have Verizon Fios, let me know where you see it or send me a link to the video or article. On the newspaper front: keep an eye out in the Asbury Park Press, NY Times, Star Ledger and The Bergen Record. There should be LBI articles in each this coming week. Again, if you find these before me, comment below with the link so I can add them to this post. Speaking of media, LBI is Alive has another social media account for you to follow: Instagram. If you are unfamiliar with Instagram, it is basically a site where you can look at users’ pictures and they are tagged in the same way Twitter posts are. I use the tags, #LBIisAlive, #SeeYouThisSummer, #LBI and #LongBeachIsland most often. Please follow me @LBIisAlive. If you have awesome LBI pictures tag @LBIisAlive so I can see and share them! As the weather gets warmer I will be taking more pictures so stay tuned! Click the blue rectangle on the far right social media column that says “View on Instagram” to follow from the site. 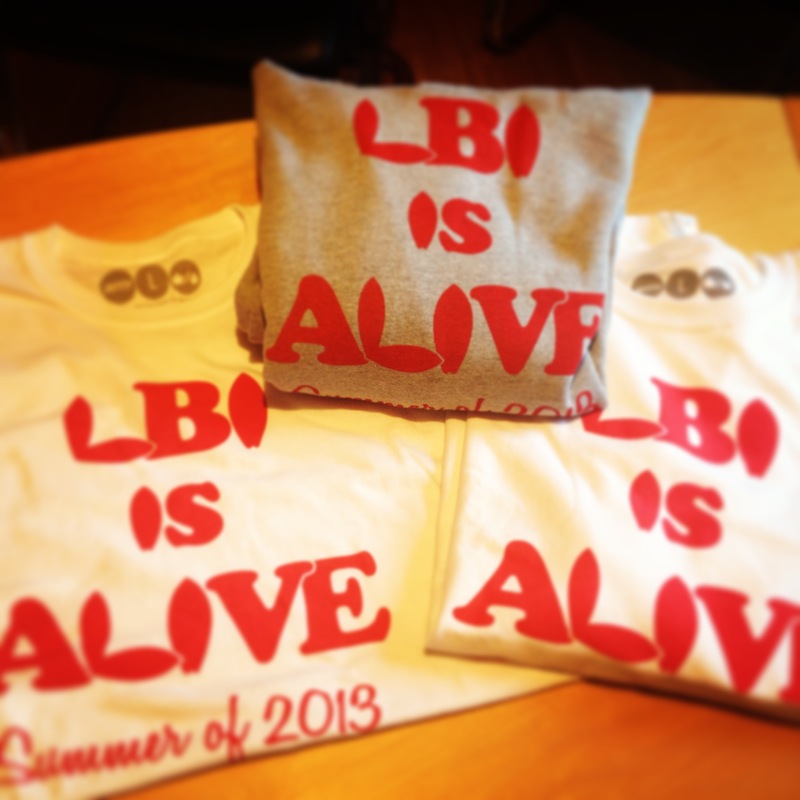 We also still have LBI is Alive T shirts, Long Sleeves and Hoodies available. The hoodies are super soft on the inside and perfect to wear on a cool summer night. The long sleeve T’s are lightweight and perfect to protect you on a day out on the water or after you got a bit too much sun the day before. And let’s be honest, you can never have too many T shirts; and if you think you do, make a T shirt quilt (I am). 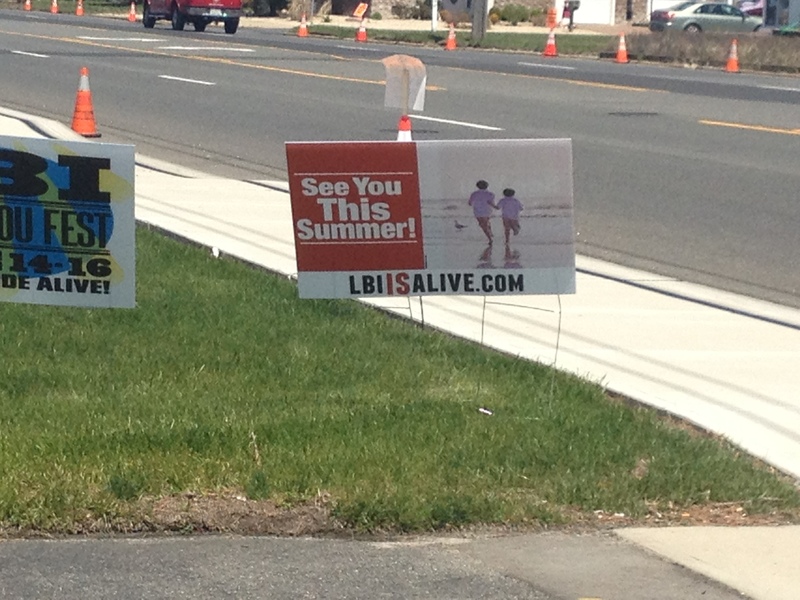 Don’t forget to spread the word: LBI is Alive! The LBI TV commercial is now airing! So far it is being shown on these networks: CNBC, Fox Business News, Fox News Channel, National Geographic, Biography, TV Land, A&E, Travel Channel, Bravo, The Discovery Channel, The History Channel, The Hallmark Channel. You can catch it during shows like Squawk on the Street, Fox Report with Shepard Smith, The First 48, Storage Wars, Real Housewives of Atlanta, Hannity, Power Lunch, Deadliest Catch and American Restoration just to name a few. Half of the slots are in the morning or evening prime time! These commercials will be aired in Central and North Jersey, including the Princeton, Skylands, Sussex, Middlesex, Morris, Bergen, Passaic and Union, New Jersey regions. Those with FIOS in Ocean and Monmouth will get some of these networks airing the commercial, including FIOS News Network and The Weather Channel Crawl. So far the commercial is airing on Comcast, FIOS and CableVision systems; more systems are being added each day. So keep checking back to see if your system is airing the commercial if you live in the above mentioned regions! Be sure to check back for more information on channels and shows or follow us on Twitter or like us on Facebook for more updates on the commercial and information about LBI! LBI is Alive! Spread the word!